Yes! The Alex Caine series is so good and kickass that it got a second release! 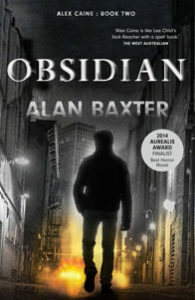 Bound, Obsidian, and Abduction are all now in paperback format as well as ebookery. 1. 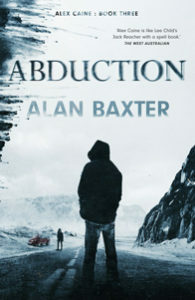 What do readers need to know about Alan Baxter? I’m a writer of speculative fiction, mostly dark weird fantastical stuff, with lashings of horror and occasional forays into science-fiction. I tend to genre-blur a lot and mix in elements of crime, noir, thriller, mystery and so on with my dark weird. I’m also a martial arts instructor, and run the Illawarra Kung Fu Academy as my “day job”. I listen to heavy metal, ride a motorcycle, have a dog who’s a complete numpty and a son who’s a delightful terror. Thankfully my wife helps out with that, and with the Kung Fu, as she’s my deputy instructor there and a master in her own right. 2. Who were/are your literary heroes/influences? So very many! Clive Barker, H P Lovecraft, Ursula Le Guin, Alan Moore, Garth Ennis, Shirley Jackson, Neil Gaiman, Douglas Adams, Anne McCaffrey… you know what? I could just go on all day doing this. Let’s just say that everything I write is supported on the shoulders of countless giants who wrote before me and many who continue to write now. 3. What was the inspiration for the Alex Caine Series, and will we see more of Alex and Silhouette? As a martial artist and writer I developed a reputation for writing good fight scenes, so I decided to write a book where the protagonist was an actual career martial artist. Alex Caine is a very successful underground MMA cage fighter. I also had this plot idea knocking around that meant taking the old-fashioned fantasy quest trope and putting it into a modern, dark/horror kind of setting. 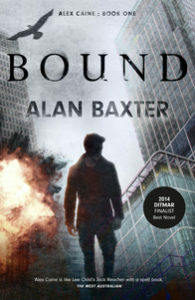 When I slammed those two things together, Alex Caine 1: Bound was born. While writing it, I realised the story was much bigger and while each novel of the trilogy is a standalone story, there’s a major arc that goes over all three books and is resolved at the end of Abduction. However, I deliberately let a number of smaller threads hang loose and there are all kinds of opportunities for more books in the Alex Caine Series. I’ve made notes, in fact, so with any luck this trilogy will sell well and I’ll get to write more. I’ve also got a few ideas for some standalone Silhouette stories, probably novella length, so that would be fun too. 4. Name five fictional characters you’d like to meet in the ring. 5. What would you say you learned from writing your early books? Brevity. I learned how to build a compelling narrative, how to keep the pace up and the pages turning, but both RealmShift and MageSign are around 120,000 words where with The Alex Caine Series each book is around 100,000. I think my improving skills in short fiction contributed to that too. I also learned that it’s bloody hard work and you simply have to sit your arse in the chair and get to work if you want to see anything finished. 6. What’s your favourite short story ever and why? Nope. Impossible question. I’m not sure I can ever really name one single story, but across the volumes of Clive Barker’s collections, The Books of Blood, are so many favourite stories. Also stuff by Margo Lanagan and Kaaron Warren just blows my mind. I think Stephen King is better at short fiction than novels, but that’s a bit of a controversial opinion. Shirley Jackson’s stories are amazing, as are Edgar Allen Poe’s. And, more contemporary again, I’ve recently talked a lot about Nathan Ballingrud’s collection, North American Lake Monsters, and Laird Barron’s collection, The Beautiful Thing That Awaits Us All, because both are absolutely superb! Look at how cleverly I avoided that awful question of choosing one favourite by listing heaps of reading. I could go on and list loads more too. I can never pick a favourite. 7. When you’re in the mood to read, who is your first choice? It really depends on the mood. For example, Clive Barker (again!) 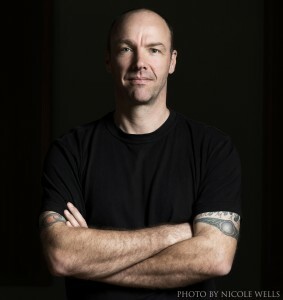 is always a go-to author for compelling darkness and twisted fantasy. If I want something with precision-sharp prose and heart I’ll go to Ursula Le Guinn. Stephen King for amazing characters. But more often than that, I’m always in the mood to read and I love to discover new and powerful voices. I’ve got into the habit recently of reading one old classic then one newer, more contemporary book. For example, I recently read Peter Straub’s Ghost Story (which is amazing!) and now I’m reading Neal Stephenson’s Seveneves. 8. What was the story/book that made you think ‘I want to write!’? 9. Who is your favourite fictional villain and/or hero? 10. What’s next for Alan Baxter? Well, all three books in The Alex Caine Series are out in paperback right about now (June 20th they hit book store shelves), so that’s my primary focus. Then my first collection of short fiction, Crow Shine, is coming from Ticonderoga Publications in September, and I’ll be Guest of Honour at Conflux at the start of October, which is very exciting. The Alex Caine Series starts its international life with Bound being published by Ragnarok Publications in December (with Obsidian and Abduction both out together in July 2017) so for everyone outside Australia and New Zealand, look out for that! I’ve got a standalone monster thriller novel called Primordial that I co-wrote with David Wood being published internationally by Cohesion Press in January. I’ve also got a mystery/police procedural/cosmic horror novella coming out soon – can’t say more at the moment, but can hopefully talk about it before long – and a new standalone noir/cosmic horror novel is out with my agent now, so that will hopefully find a home before too long as well. And on top of that, I’ve got a new standalone horror novel out with beta readers right now, and I’m working on another collaborative novel with David Wood, an action adventure thriller with occult trappings. And I’ve just started work on a new standalone crime noir novel with supernatural leanings. Bloody hell, when you make me write it all down like that it seems like quite a lot. No wonder I’m tired! This entry was posted in News and tagged Alan Baxter, Ann McCaffrey, Ballingrud’s collection, batman, clive barker, Crow Shine, edgar allen poe, harpervoyager, kaaron warren, Laird Barron, margo lanagan, neil gaiman, North American Lake Monsters, Per, Sandman, stephen king, The Great and Secret Show, Ursula Le Guinn. Bookmark the permalink.